FLINT, Michigan — The Ruth Mott Foundation named Raquel Thueme president of the organization that invested more than $6 million last year to impact youth, public safety, neighborhoods, and economic opportunity in north Flint. Thueme is the fifth president in the foundation's history. While Thueme is new to this role, she joined the Ruth Mott Foundation in 2011 as a program director and went on to serve as vice president of programs. She has more than 30 years experience in the nonprofit sector. She also brings to the job a life experience shaped by growing up the daughter of parents who immigrated from Mexico to Michigan and attending Detroit Public Schools until earning scholarships to work her way through Cranbrook Schools, Harvard for her bachelor's degree and the University of Michigan for her master's. Professional achievements: Currently President of the Ruth Mott Foundation; Previous executive experience includes four years as president and CEO of Big Brothers Big Sisters of Metropolitan Detroit, as well as executive leadership positions in hospital and healthcare organizations with Trinity Health, one of the largest multi-institutional Catholic health care delivery systems in the nation. Favorite (or recently read) book. Please explain why it is significant: The last book I read was “The Elephant Whisperer,” a non-fictional account of South African conservationist Lawrence Anthony’s experience taking in a herd of wild elephants on his Thula Thula Zululand game reserve that later became known as a refuge for ‘problem’ and unwanted elephants. I enjoyed it for two reasons. First, because visiting a game reserve in Africa is on my bucket list – I love to travel and be exposed to new experiences and cultures. Second, because of the life lessons in the book. Anthony was asked to accept this herd of ‘rogue’ wild elephants or they would be killed – he was the herd’s last chance of survival. He worked to create a bond with the elephants and he discovered amazing things about the species and himself that provide life lessons on trust, loyalty, freedom, reconnecting with nature, and overcoming obstacles. Who are your role models? My parents were my first role models and inspiration. They came here from Mexico with six children in tow and always stressed education, hard work, and community involvement. I was the only one of my siblings born in the United States, and we all were able to realize the aspirations that my parents had for us because of the opportunities they provided. I feel a responsibility to pay that forward for others. Etc. : After a quick cup of coffee, you can find me most early mornings at boot camp or spin classes – or both. Physical activity and healthful eating are important to me and help keep my energy up and stress down. Now if I could only get more sleep! I also consider myself a lifelong learner and always look for opportunities to listen and learn from colleagues and the community as well as more traditional sources of gaining specific skills and knowledge. I am fortunate to work in a field that encourages, fosters and values continual learning and I try to apply that learning to make a positive difference. Congratulations on your promotion to president of the Ruth Mott Foundation. Why is this something that you wanted to do? Thank you! The work we’re doing here in Flint is highly personal to me. I grew up in the shadow of a General Motors assembly plant in Detroit, and I saw and experienced life parallels to Flint. I saw what happens to the people in the neighborhoods as the result of plant closures. I saw it again as a hospital administrator on the east side of Detroit. I’ve always wanted to work in a job and career where I felt I was helping those who wouldn’t otherwise have many opportunities to rise out of poverty, specifically by addressing barriers to resources or basic needs like quality healthcare, education, and housing. The Ruth Mott Foundation is committed to changing conditions like the ones I experienced growing up, and it’s been an honor to lead the organization and continue that commitment as president. Can you tell us about the north Flint strategic plan and if you expect to continue that funding focus? We shifted our focus to north Flint because it’s an area with significant challenges, limited resources, and — perhaps most importantly — an opportunity to make a significant difference in the lives of Flint residents. North Flint encompasses what is traditionally referred to in Flint as both the east side and the north side. We define it as everything north of the Flushing Avenue, 5th Avenue, Robert T. Longway Boulevard corridor, which is a little over half the city. Practicing “shoe-leather philanthropy,” we gathered extensive feedback in the community over many months and we adopted the four priorities for our funding that residents told us were most important to them: youth, safety, economic opportunity, and neighborhoods. We started our north Flint grantmaking in 2015, and we are committed to the strategy at least through 2020. Has the north Flint strategic plan made any impact? We know that north Flint has experienced decades of disinvestment and that’s not going to be reversed overnight. But we also know that in just under three years of this strategy, we are seeing the impact of this place-based, very focused investment. Some of the most visible examples are the eight neighborhood hubs that we fund throughout the north Flint focus area. The combination of direct support from grants in addition to capacity building services tailored specifically to each organization has allowed them to grow and strengthen their infrastructure and more effectively meet the needs of residents while simultaneously generating community vibrancy well beyond their immediate footprints. Four years ago, the former Bunche Elementary was a vacant shell on Martin Luther King Avenue. The Ruth Mott Foundation awarded grants and provided a loan guarantee for the Evergreen Community Development Initiative, which allowed them to transform a shuttered elementary into what is now the bustling Flint Development Center. All the neighborhood centers are valued and offer an array of programming, from youth development to job training to recreation, and they also are one of the best avenues for translating social cohesion to meaningful action. They are safe venues for neighbors to come together, contribute to neighborhood stability and upkeep, and deliver important resources and supports to residents of all ages. In looking at those examples, and at our community dashboard, we know we’re making a difference. We also know that there is still more work to do in north Flint, and we hope our strategy will inspire others to make a greater investment in north Flint as well. In recent years, there has been a noticeable change for Applewood. It now is much more open to the public. Do you expect to continue welcoming visitors to the estate? Absolutely! From listening to community members, we have gained some insight on how best to make Applewood serve and support community priorities, and we design our events and programs using that feedback. Our founder, Ruth Mott, envisioned Applewood would open to the public as a place of beauty and tranquility and as a memorial to the accomplishments of her husband, Charles Stewart Mott. We know that community members have appreciated Applewood being open on a regular and consistent basis, and we expect to continue that into the future. Applewood opens for the season this year on May 2 and will be open 11 a.m.-5 p.m. from Thursday to Sunday through the season’s end in October. What's next for the Ruth Mott Foundation? Any immediate and/or long-term goals you can share? One of your previous questions was about impact, and we’re excited about an ongoing project related to seeing our impact in north Flint. About a year ago, we launched our North Flint Community Dashboard, which is an online tool that displays north Flint data in the areas of Youth, Safety, Economic Opportunity, and Neighborhoods. Soon, we’ll be launching the second phase of that project, which is a tool that will allow our grantees to upload data from their own programs and really examine the difference that they’re making in their areas. 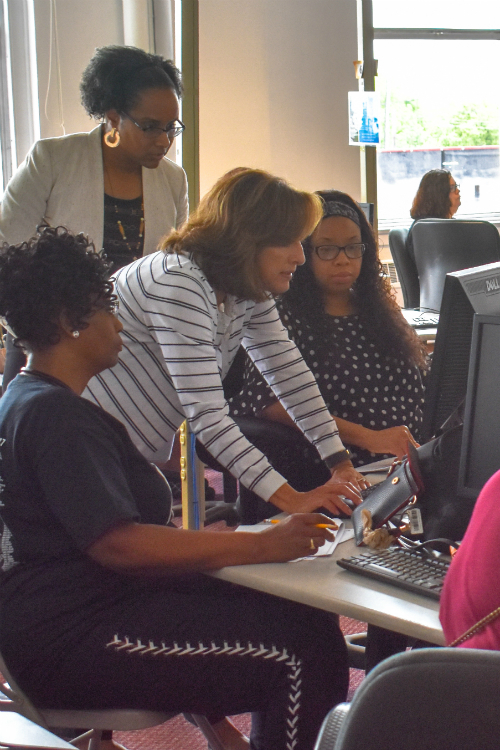 Among other uses, the dashboard can help organizations apply for grant funding and advocate for beneficial policies or programs, assist our grantees in evaluating and reporting on their progress, and it helps keep the Ruth Mott Foundation accountable for the work we’re doing in north Flint. Why Flint? Why do you choose to be and work here? I consider it a privilege to be a part of a community that has a little bit of attitude and a huge heart. Flint is a tough city and a resilient city. When I started working here in 2011, Flint grabbed a hold of me, and that grip has only gotten stronger in the years since.